It’s Friday night before a three-day weekend, yes!! And it’s been gorgeous, supernaturally summery, glowing, blue-sky weather, perfectly in the 70s. My nose is running on one side due to allergies from all the blooms and blossoms, including little pink flowers on the plum trees in front of my building. We had a storm come through last weekend, and the much-needed rain seems to have triggered expansive green lawns and the beginning of spring. I ended work early today and sat in the Botanical Gardens with J and K and babies E, M, and M while the low sun slid behind the trees and the babies shook their rattles and ate leaves when we weren’t looking. I just got a text from my neighbor that Obama is dining at Spruce, a restaurant one block down the street from me, right now. What a crazy idea! Here I sit in my regular ol’ quiet apartment, as I do each night after E is asleep, and suddenly I’m in proximity to the President. Makes this moment seem rather extra-important. Hold on, I’m going to look out the window for Secret Service… Wow, the street is closed off in front of the restaurant and lots of vehicles out front. Makes me nostalgic for my many nights watching The West Wing while prego. Today I watched a video of the woman in North Carolina who won $500+ million in the lottery yesterday. She’s 26 years old, with four kids, one of whom has cerebral palsy. She most recently worked at McDonald’s and Walmart and quit to take care of her kids–she seems to be a single mom. The reporter kept asking her about what she’s going to buy first–don’t you want a house, a car? And she was so contained. She just said, yes, she’ll get those things, but this is all for her kids, her family, which had been such a source of struggle for her. But all worth it. She wouldn’t change a thing–those kids are a blessing, she said. This struck me for so many reasons. First, it dawns on me that even $500M doesn’t solve all your problems. If you weren’t grateful before, you’re not going to be grateful after (and she seemed authentically grateful). On top of that, now you have stresses about how to spend all that money, and people angling to get some of it. Which led me to my next realization, which I’ve had so many times before: you never “get there.” You never achieve that perfect equilibrium in all things that allows you to take a break and rest and be done. Even if that’s the directional goal, people only get there for probably a matter of a few minutes at a time. As they absorb the good news. Or as they reach a place of peace in meditation. So we’re back to appreciating what we’ve got. MAN, I’m a one hit wonder on this. It’s like every single time I get reflective and have a meaningful realization, it’s the same one. We have to manually put the spotlight on the positive because there are always many, many, many things going right. I have a work colleague who is also a facebook friend and she’s spending time cataloging “Good Things.” For example, this flowering bush she passed on the way to work. Or a roaring fire in the fireplace. She said that this project makes her walk around looking for “Good Things.” Why not? The best thing to happen this past week is that I got E to sleep in his crib. He’s been co-sleeping with me since birth, and napping in the bed. Now that he’s crawling, I was trying to monitor him more carefully when I wasn’t in the room with him, but counting on the fact that he’d cry when he woke up. Well, he stopped crying upon waking and on Saturday I found him standing at the foot of the bed next to the gap where there is no side rail, holding onto the crib at the foot of the bed. Basically looming directly above the space where he could fall. I had put my mattress on the floor but it’s still over a foot off the ground. So, I thought, no more. No more naps in the bed. But the next day I decided to try just one more time (because I needed to get a few things done) and I’d be really on top of it. And this time, he found a gap that had appeared between the bed and the wall and got himself wedged–I heard the thump (because I was right on the other side of the wall) and ran in, and he was fine but that was the last straw. Time to face some version of dreaded sleep training. Just so he will sleep in the crib when I’m not around (we continue to co-sleep after his first waking for the rest of the night). So, I came up with my own “crib training” routine and that little rascal was the perfect student. I’ve been really careful to maintain a consistent bedtime routine. Bath, diaper, massage, PJ’s, book, nurse. The first night, I set him in the crib and he was unhappy. I laid down on the bed next to the crib and reassured him, rubbed his back, sang, said shhhh. He was up and down, crying and quiet, frustrated, playing, reaching for me and saying, “MOM,” “MOM.” I was inches away from him and calm. I would guess it was 45 minutes by the time he finally flopped down and went to sleep. The next night, it was 15 minutes with minimal crying. The next night, 5 minutes. Tonight–he was asleep when I set him down. He cried out once and was out again. Even his mid-evening wake-ups now involve like one or two cries and then he’s back to sleep. I think he feels more secure in there. This is freaking unbelievable. I dreaded this process for so long and he just rolled with it like a champ. That first night was not easy but it also wasn’t the type of revving up that results in the child getting dangerously upset. I could tell he was reacting to the change, but he was still winding down. I feel so relieved that it wasn’t as bad as I had feared and also relieved that he is safe in there. In the car, when I turn around to check on him in the mirror, his face goes from spaced-out to recognition to a huge smile that spreads across his face. Which of course makes me duplicate the action like ten times. Tonight, every bite of food (black beans, spinach/broccoli/pear purée, and pasta with kale-walnut pesto) got a literal round of applause. There’s a mirror perfectly placed so that if we turn to the side, we can wave at our reflections. So we do. I love watching this baby grow in slow-mo, beginning to babble-talk, making connections and anticipating things he knows (like when I say, “giddyup, giddyup, giddyup, giddyup,” I’m about to say, “WHOA” and turn him upside down). He points at everything. He wants to touch it and put it in his mouth, no matter what. He does “dancey-dancey” when he sees Mimi and Chacha on facetime. 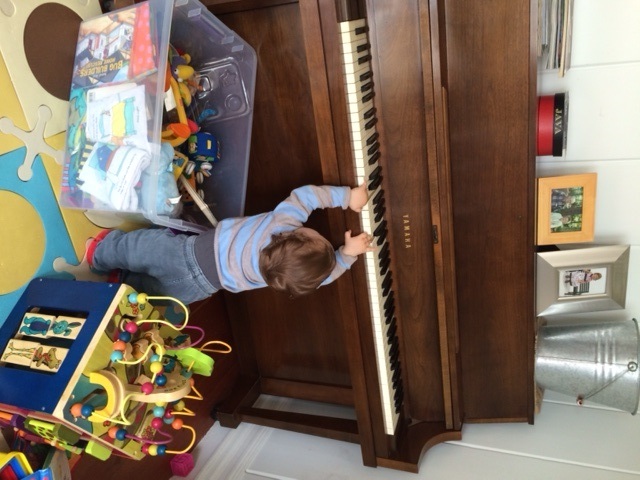 He smacks his hands on the hardwood floor when he crawls–I can always hear when he’s on the move. I mean–I don’t have $500M. And our little two-person family doesn’t include a dad. And my job has its share of stress. But being a mom to E is just beyond words. The friends I’ve made, the rediscovery of the city I love most, the huge exponential love of my family… It’s nuts. Warm night air through the open window. Sleeping baby in the crib. ‘Night, Obama. please let us know how modified sleep training continues to go.